In December of last year I commented on the graffiti-patch phenomenon, where tags on a building were ‘de-erased’ with a quick roll of grey paint. The word on the SLAB grapevine is that this wasn’t the work of some quick-on-the-draw janitor, but of another graffiti artist. Some weeks after my observation I came across an issue of Sleek magazine which had documented an energy-drink-sponsored street art project called Outsides, which took place in the German city of Wuppertal. 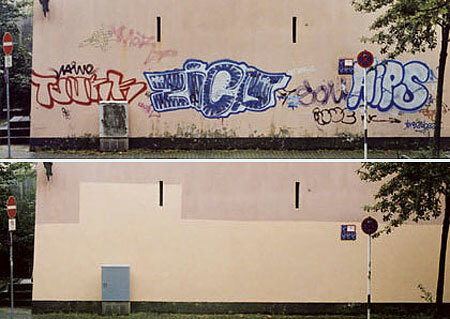 Striking was the work of the Nixfitti collective whose contribution was the removal of existing grafitti by painting huge neat blocks of paint onto the offending walls in a colour very similar to the background. They even masked off the edges. Before (top) and after (bottom). Graffiti: not what it used to be. Meanwhile in Berlin, another example of urban camoflage can be found on Zossener Straße where patches have transformed a whole house-front into a constantly shifting mural. It’s bold geometic forms, reminicent of hard-edged abstract art, are all based on the soft underlying forms, which are usualy nothing more than inept scrawls. Instead of posting a photo of the whole building I’ve decided to make a schematic drawing of the ground floor façade which I plan to continually revise. If at some point enough revisions have been made to make an animation, then I’ll post that too. Could take a year or so though, so do hang around.